This kid is 13 months old today! 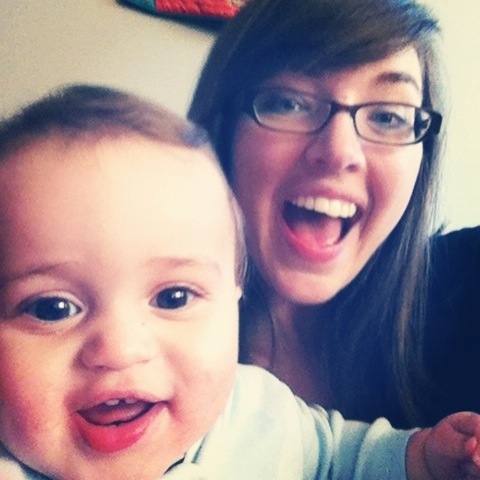 You may be thinking to yourself – what aunt celebrates their nephew’s 13 month birthday?! You’re right. It’s weird. But is it any less weird if I tell you that I thought of the PERFECT gift for my just-over-one-year-old nephew on his actual birthday, February 7th? And that it was just too perfect not to make for him so I got to work on it straight away even though I had no experience in this particular craft? I’m a month late, but, in this case, I think it was worth it. Happy Birthday Jonah! 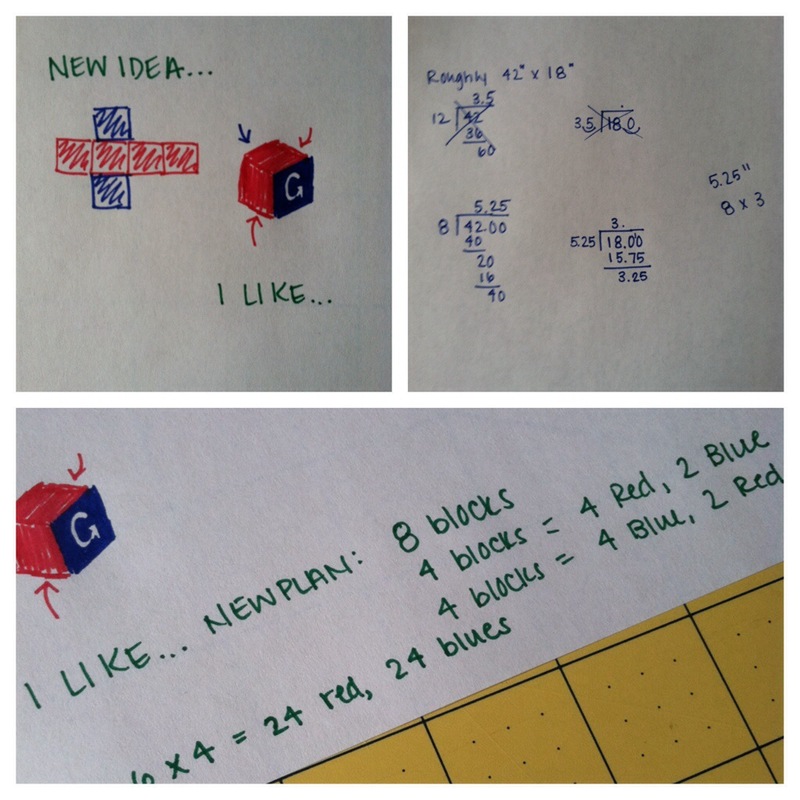 I hope you love your soft squishy Gonzaga Blocks! Let’s be real – I fully realize that Jonah can’t yet read (though he’s very advanced and a genius baby and in the 200th percentile for everything) and he has no idea of the subliminal messaging attached to this particular gift. So I just want to go ahead and say that this gift is just as much for his mom (my sister-in-law) as it is for him. 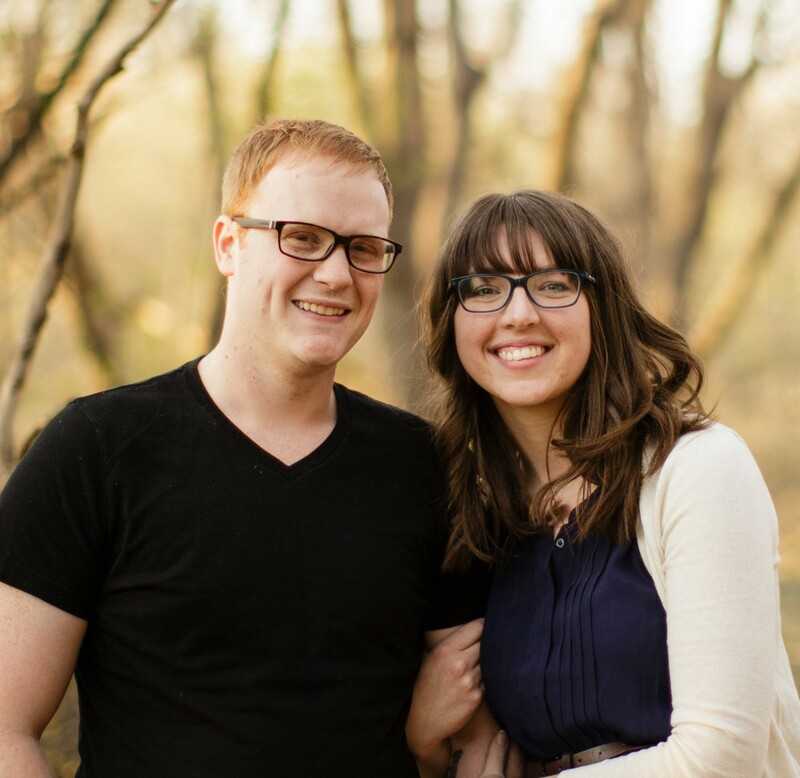 Jenni and Jobin went to Gonzaga for undergrad and fell in love almost immediately. They got married in Spokane and they are the BIGGEST fans of the Gonzaga basketball team. And did I mention that they were both cheerleaders (real, super in-shape cheerleaders) for the team all four years? 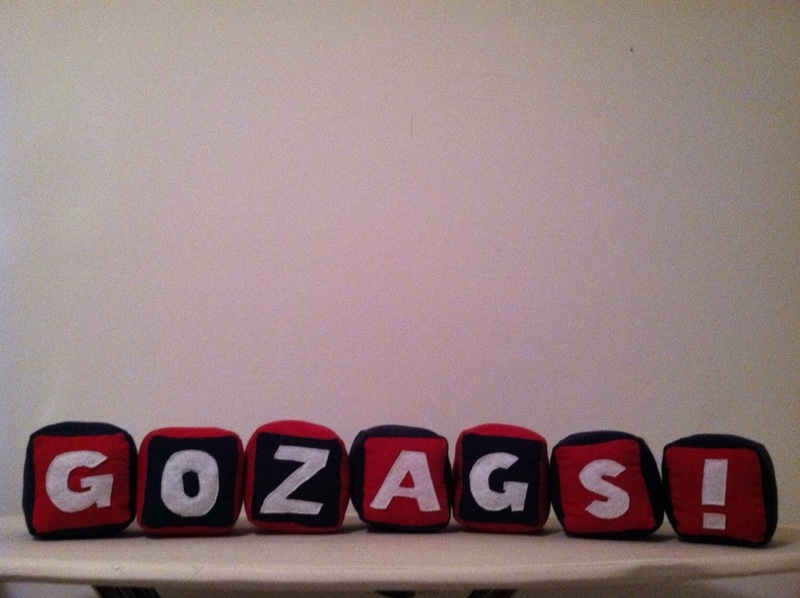 I honestly didn’t realize how intensely obsessed they were until this past year…Jonah has been decked out in Gonzaga gear since birth. They. love. this. team. And they would love nothing more than for Jonah to continue in their footsteps and attend Gonzaga in 17 years. 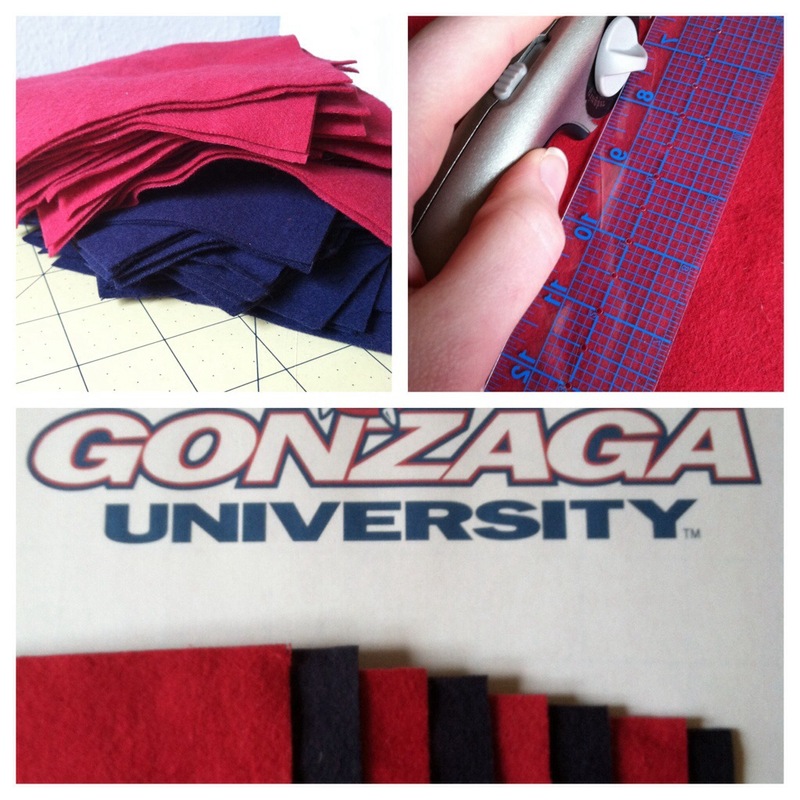 And as Jonah’s Aunt & Uncle, we are also pro-Gonzaga, because Washington. 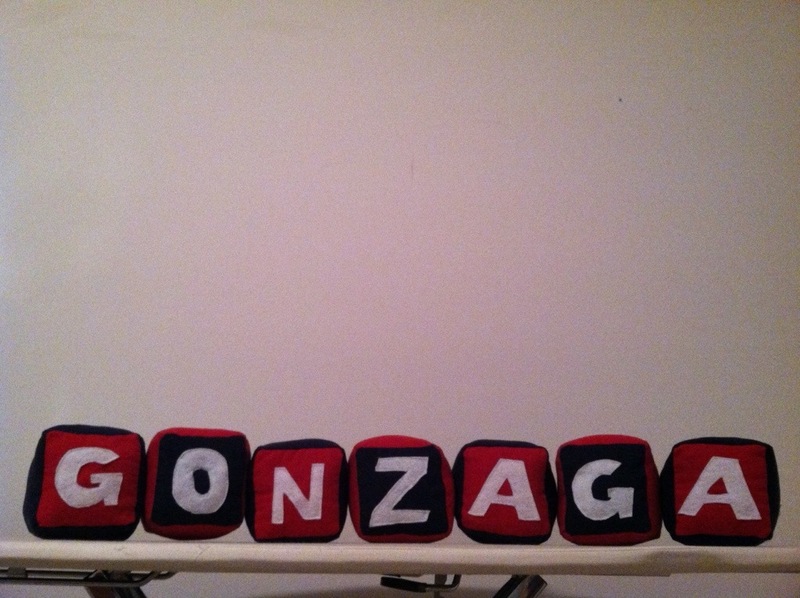 All to say, I’m all about playing my part in convincing Jonah that Gonzaga is the school for him. 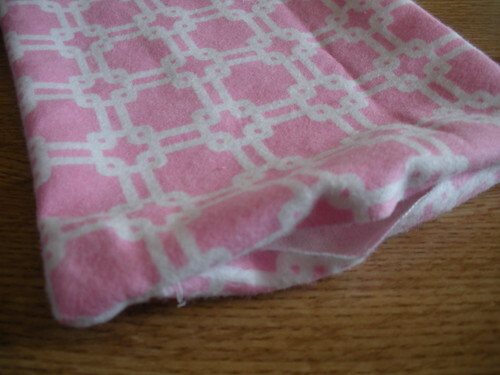 After I drew some pictures to figure out my plan of action, I cut out my fabric. As I started to sew these together, I realized “I’ve never sewn anything cubed before…” Thankfully I figured it out pretty quickly. The letters were the hardest part. I started to embroider them, but quickly realized that would take FOREVER. Then I tried using various stitches on my sewing machine to faux-embroider them and that didn’t work either. Then I decided to use felt, which was still difficult as I free-handed the letters with my new Xacto knife set (a story for another time – but shout out to Deb Mortvedt!) but the result was satisfying. I loved the way they turned out, even if they were a month late. Happy Birthday Jonah! And Happy March Madness! Go Zags! 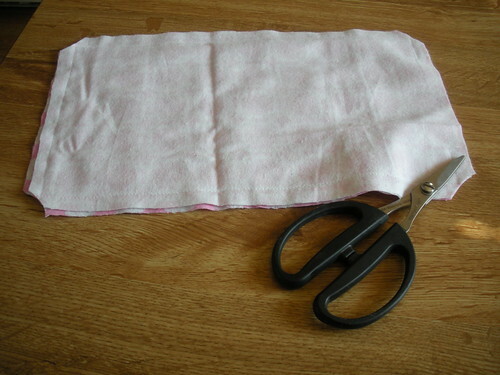 step one: cut two 12″x7″ rectangles from your fabric of choice. you can use whatever you have, but i chose flannel because it’s nice and soft, yet sturdy. 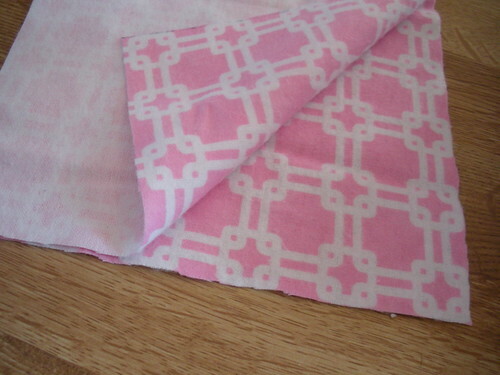 step two: with right sides together, line up fabric. 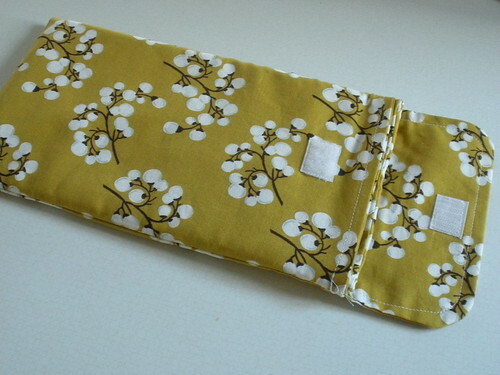 sew around the edges using 1/2″ seam allowance and leaving a 4″ opening at the top. 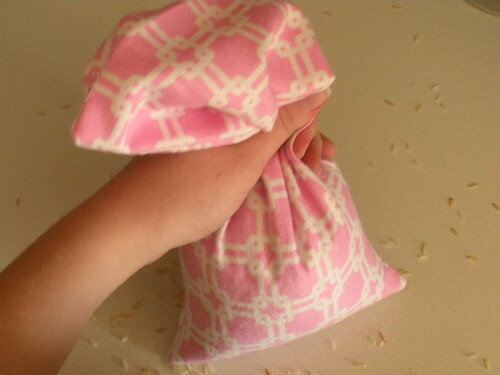 step five: fill pack with rice. it doesn’t matter what kind you use as long as it’s not instant! as you can see [above] i used exactly three cups. you don’t want it to be super full. if you’re making a different size pack, you can see [below] that i filled it a little over half full. 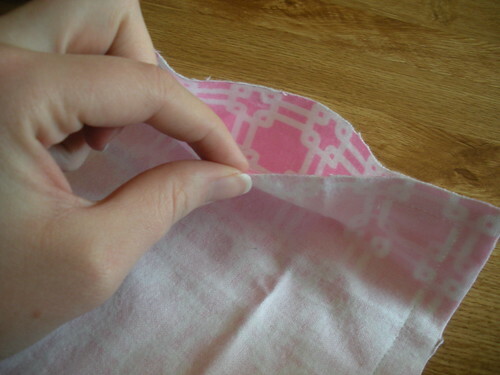 step six: top stitch over the opening. 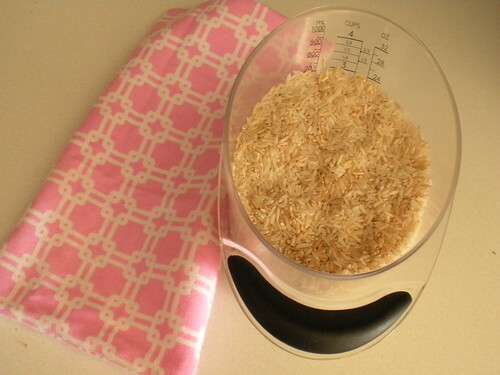 microwave pack for 1-1.5 minutes and use as needed! this pack pits perfectly in the small of my back and also fits well underneath my neck. you could also try putting lavender or something similar inside to give it a nice aroma. we were in ames for easter last weekend-it was our first time missing veritas since we began 7 months ago! it was definitely weird to be away. but we loved our time in ames with my family too and at cornerstone, our amazing “mother church.” quick non-sequitur: after being in a teeny church for almost a year, bryan and i were just in awe of the well-oiled machine that is cornerstone. everything runs so smoothly, and the quality of everything there is outstanding. even the programs were printed on nice paper and perfectly folded! it was magical. anyway, because it was our first time back in ames since christmas, i knew i wanted to make sure to meet two very important babies. two of my dear friends from our old connection group had babies in november of last year and i hadn’t met them yet! i also wanted their moms to feel loved too, so i made each of them a “latte changing pad.” the one pictured is the one i gave to whitney. i used a blue and green animal print for rachel’s since she had a baby boy. 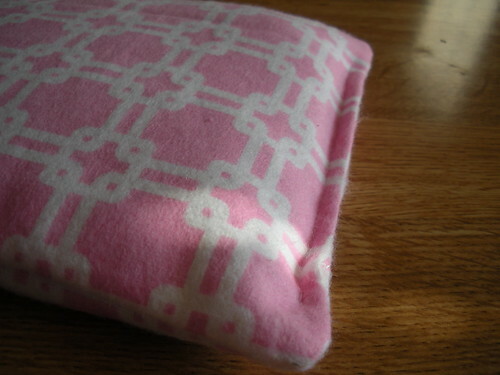 i found the pattern in a book a received for christmas, one-yard wonders: 101 sewing projects. 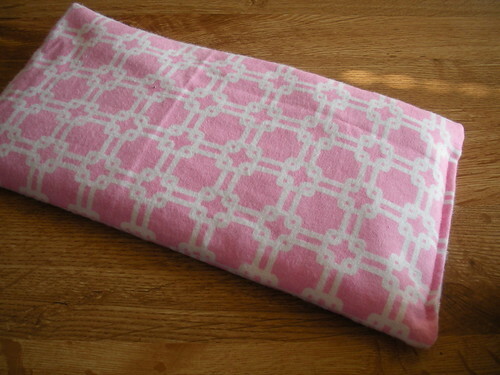 this is the book’s description of the project: this compact changing pad and sleeve can hold a small package of wet wipes and two or three toddler diapers. 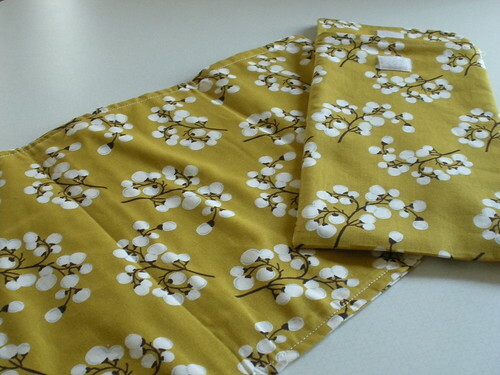 it is intended for the toddler mom who no longer needs a big diaper bag, as it can be rolled up and tucked right inside your purse. perfect for a trip to the coffee shop! i thought that sounded perfect for them, as their babies are already almost 6 months old! it was fun to give my friends a simple little gift of love and meet their babies-love you Rachel & David and Whitney & Gracyn! whew, this is definitely the biggest project i have undertaken yet. and i am so proud of how it turned out. my cousin and i say all the time, knitting is magical. it really is! what was once a rolled up piece of yarn is now a beautiful blanket, ready to provide warmth and comfort for it’s owner, which in this case is baby thune. our pastor’s wife, ashley, is due in may. a bunch of us church women gathered to celebrate with her last sunday, we’re all so excited for this baby! i absolutely loved ashley’s face when she saw the blanket, it made all the time spent on this fun project worth it for sure. i’ve had the joy of getting to know ashley this semester in a bible study we’re in together, and when i saw this pattern, i knew i wanted to make this for her! 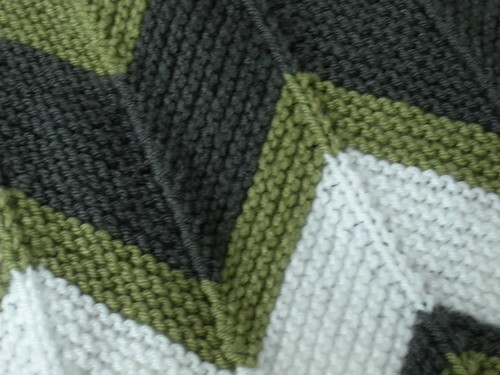 i found the pattern, by the way, in a brand new book called a knitter’s home companion. it’s written by an iowa city local and is a most adorable collection of stories, recipes, and knitting patterns. it’s also the only book i have finished so far this year, so it has that going for it. if you’re a knitter, i highly recommend picking this book up! photo taken by the amazing sarah nebel! you need to check out her photography, so cute! 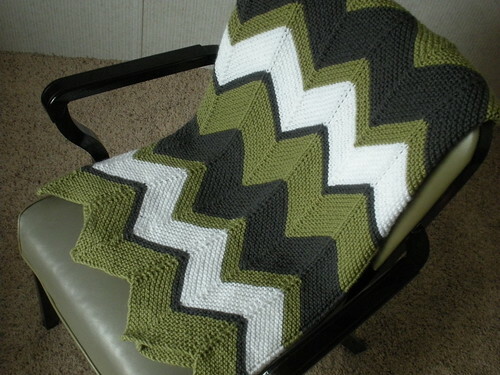 this is another pattern i created myself, which is really good for me to keep practicing. it was difficult to get the sizing correct as i got a lot of different information on head sizing. 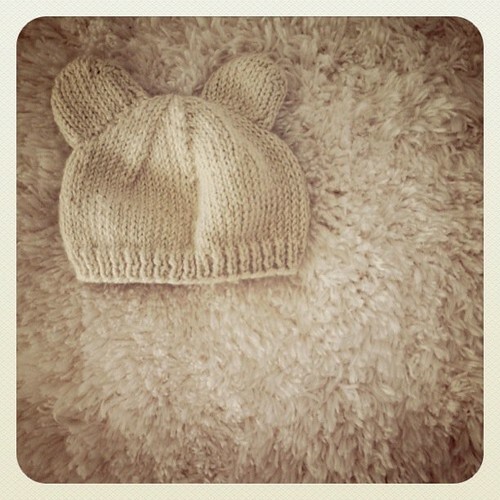 in the end, this hat is about 15″ around, which is a pretty good size for 6-9 months. i’m in love with the cream color and the adorable little ears. i can’t wait to see what sarah does with it! 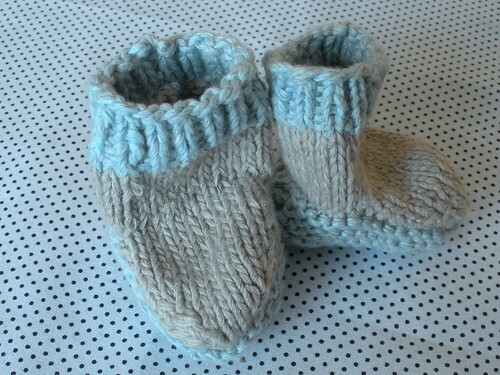 anyway…i made the booties and this teeny tiny hat for veritas‘ first and favorite newborn, hudson michael! 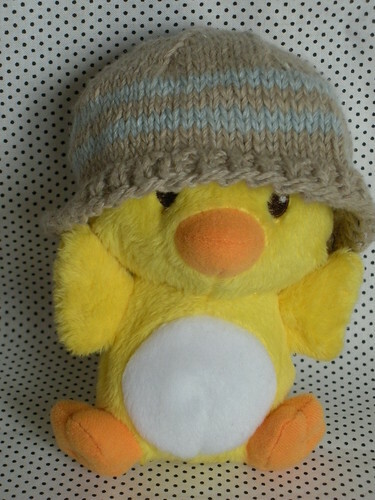 doesn’t the duck make a cute hat model? 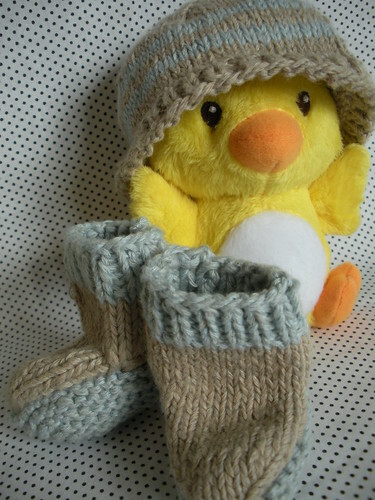 aren’t these just the cutest? i found the basic pattern here. i think the “moccasin” style is stinking aborable, but my mom pointed out that most moms like to have simple clothing that will go with a lot. she’s so wise. so i used a neutral “boot” color and a blue. 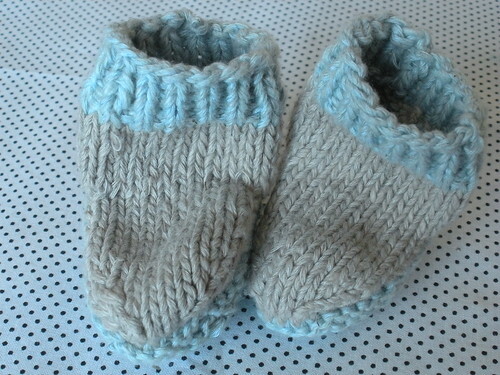 it was a challenge working with such tiny needles, but now i’m that much more practiced at knitting.